Geneva - The International Air Transport Association (IATA) announced global passenger traffic results for 2017 showing that demand (revenue passenger kilometers or RPKs) for the year ended 31 December rose 7.6% compared to 2016. This was well above the 10-year average annual growth rate of 5.5%. While the rate of demand growth slowed to 6.2% in December 2017, compared to December 2016, this largely was owing to less favorable comparisons to the even stronger growth trend seen in the year-ago period. Full year 2017 capacity rose 6.3%, and load factor climbed 0.9 percentage point to a record calendar-year high of 81.4%. "2017 got off to a very strong start and largely stayed that way throughout the year, sustained by a broad-based pick-up in economic conditions. While the underlying economic outlook remains supportive in 2018, rising cost inputs, most notably fuel, suggest we are unlikely to see the same degree of demand stimulation from lower fares that occurred in the first part of 2017," said Alexandre de Juniac, IATA’s Director General and CEO. 2017 international passenger traffic soared 7.9% compared to 2016. Capacity rose 6.4% and load factor climbed 1.1 percentage points to 80.6%. All regions recorded year-over-year increases in demand, led by the Asia-Pacific and Latin America regions. Asia-Pacific carriers posted annual demand growth of 9.4%, compared to 2016, driven by robust regional economic expansion and an increase in route options for travelers. This was the first time since 1994 that Asia-Pacific led all the regions in annual growth rate. Capacity rose 7.9%, and load factor climbed 1.1 percentage points to 79.6%. European carriers’ international traffic climbed 8.2% in 2017 compared to the previous year, underpinned by buoyant economic conditions in the region. Capacity rose 6.1% and load factor surged 1.6 percentage points to 84.4%, which was the highest for any region. Middle East carriers’ traffic increased 6.6% last year. The region was the only one to see a slowdown in annual growth compared to 2016, and the region’s share of global traffic (9.5%) fell for the first time in 20 years. The market segment to/from North America was hit the hardest owing to factors including the temporary ban on large portable electronic devices in the aircraft cabin as well as the proposed US travel bans affecting some countries in the region. Capacity climbed 6.4% and load factor rose 0.1 percentage point to 74.7%. North American airlines had their fastest demand growth since 2011, with full year traffic rising 4.8% compared to 2016. Capacity climbed 4.5%, and load factor edged up 0.3 percentage point to 81.7%. The comparatively robust economic backdrop supported outbound passenger demand. This was somewhat offset by a slowdown in inbound travel partly attributable to the new immigration and security restrictions put in place for travel to the US, as well as the extreme weather events that hit the US later in the year. Latin American airlines’ traffic climbed 9.3% in 2017, the fastest rate since 2011. However, the upward trend weakened towards the end of the year, partly owing to disruption caused by the severe 2017 hurricane season that also hurt travel to the US. Capacity rose 8.0% and load factor increased 1.0 percentage point to 82.1%, second highest among the regions. African airlines saw 2017 traffic rise 7.5% compared to 2016. Capacity rose at less than half the rate of demand (3.6%), and load factor jumped 2.5 percentage points to 70.3%. While indicators in South Africa are consistent with falling economic output, Nigeria has returned to growth, helped by the recent rise in oil prices. 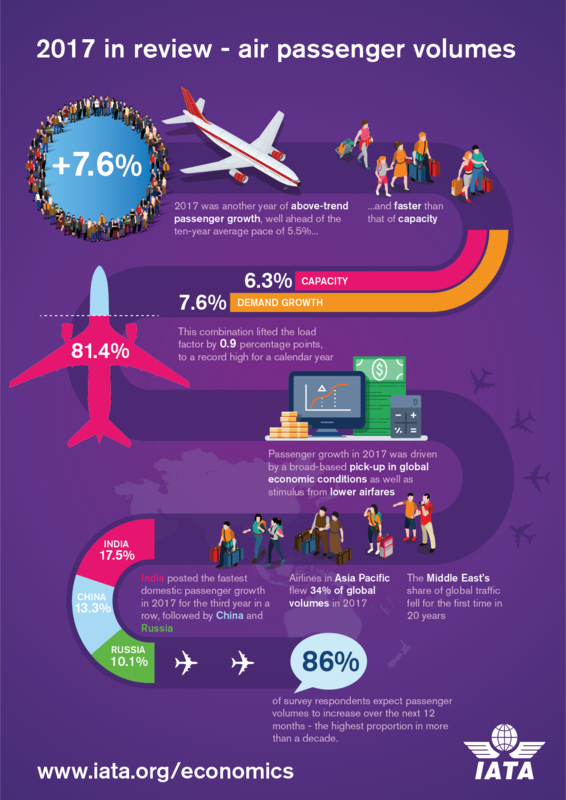 Domestic air travel climbed 7.0% last year. All markets showed annual growth led by India, China, and Russia, albeit with wide variation. Capacity increased 6.2% and load factor was 83.0%, up 0.7% percentage point compared to 2016. Japan posted its fastest full year of growth (up 5.8%) since 2013, driven in part by the country’s stronger economic backdrop. Brazil’s domestic traffic returned to growth last year with a 3.5% demand increase, after recording an annual decline of 5.5% in 2016. "Last year, more than 4 billion passengers used aviation to reunite with friends and loved ones, to explore new worlds, to do business, and to take advantage of opportunities to improve themselves. The connectivity provided by aviation enables goods to get to markets, and aid to be delivered to those in need. Aviation truly is the business of freedom, liberating us from the restraints of geography to lead better lives. Aviation can do even more in 2018, supported by governments that recognize and support our activities with smarter regulation, fairer taxation, cost efficient infrastructure and borders that are open to people and trade," said de Juniac.